Expert, unbiased advice for buying the best window AC unit, wall air conditioner, portable AC unit, or mini-split air conditioner for your home. If your home doesn’t have central air conditioning and you’re looking to affordably and effectively keep it cool this summer, one or more room air conditioners may be your answer. Several types of single room air conditioners are available. But what is the right one for your home? And, once you decide on the type, how do you select the best brand? This article will help you make smart decisions about whether a room air conditioner is right for your needs and, if it is, which one to choose. Window air conditioner installs quickly and easily and provides effective cooling for one room. Shop for window air conditioners now. Why a Room Air Conditioner? Single room air conditioners can be a very affordable way to cool down a room or part of your house, condo, or apartment. Unlike whole-house central air conditioners meant to cool an entire house, they focus on cooling just one area. This means they don’t require routing ductwork throughout the house. And, because of their limited capacity, they only consume a portion of the energy compared to whole-house air conditioners. Relative to central AC, they are affordable to buy, install, and operate. Bottom line: Room air conditioners make sense if you only want to cool a room or two, you don’t want to spend the big bucks on a whole-house system, or if you don’t own the building where you live. For additional comparisons between room and whole-house air conditioners, see Central Air Conditioning vs. Window AC — Which Is Best? For more about central AC, see Central Air Conditioner Buying Guide. When buying a new room air conditioner, the trick is to select the type and model suited to your room and your budget. The right AC unit for you should handle the job affordably, efficiently, and reliably. 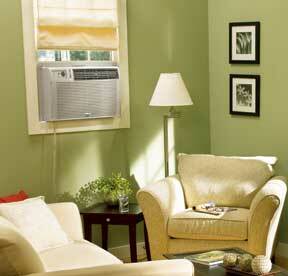 • Ductless mini-split air conditioners. The right type may depend on the room. If you live in a rental and the room has a window, then a window AC unit is probably best. If the room doesn’t have an appropriate window, you’ll probably need a portable air conditioner. If you own your home and you don’t mind undergoing some construction work, you can broaden your options to include a through-the-wall AC unit or a ductless mini-split AC system. Of course, central air conditioning is also an option. All air conditioners are rated by their cooling capacity, measured in Btu. (See What Is a Btu?) For more about picking a unit with the right cooling capacity, see Sizing An Air Conditioner, below. Window air conditioners are by far the most popular type of single-room AC units. Models are sold in various sizes, from very small to large, and are rated by their cooling capacity. Most are designed to fit standard or double-hung windows. Some will fit in sliding windows. A window AC unit doesn’t have to be the same size as the window—it can be narrower. Nearly all models come with plastic adjustable panels that fill gaps on each side of the appliance for a secure fit. Because those adjustable panels are ineffective at blocking heat gain, most manufacturers sell insulating panels that you can place over them. Expect to pay from about $150 to $500 for a window air conditioner, depending upon size and cooling capacity. Features to watch for include a dirty-filter indicator, a start timer so the unit can start before you return home from work, and a remote control. Noise is another issue you’ll want to consider. Most reviews, such as those by Consumer Reports, rate the noise level of various models. Installing a window air conditioner is a relatively easy DIY project, as discussed in the article How to Install a Window Air Conditioner. Of course, the larger the air conditioner, the heavier it will be—you’ll want to have help if you’re installing a medium- or large-size air conditioner. Make sure you measure the inside window dimensions before you shop. Most window air conditioners come with easy-to-use installation kits. Directions and hardware should be included. Through-the-wall air conditioners require opening a hole in an exterior wall, a job that is considerably more involved than installing a window unit. On the plus side, a wall air conditioner doesn’t take up window space, and it allows for a more airtight and secure fit. 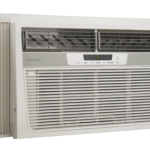 Wall air conditioners are priced about the same as good window units, from $300 to $500. 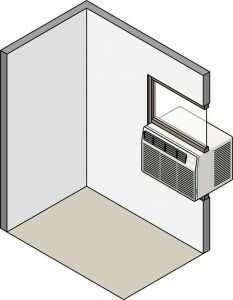 Most window AC units will adapt to installation in walls—you just add a frame to support the unit. Though large units may require professional installation, handy do-it-yourselfers can install a small through-the-wall air conditioner. Just keep in mind that you’ll have to deal with multiple facets of building, from cutting the hole through the wall to finishing the interior wall and weatherproofing the unit where it penetrates siding. Portable air conditioners are self-contained, freestanding units. Most have casters, so they can roll around to the room or rooms that need to be cooled. Most come with a large, flexible hose that attaches to a window for exhausting hot air, similar to the way a clothes dryer vents. You can also buy a “no-vent” portable air conditioner with a hose. However, this isn’t actually an air conditioner. It is an evaporative air cooler (also called a “swamp cooler”). For more, see Evaporative Air Coolers (Swamp Coolers) Buying Guide. Though portable AC units usually cost more than window and wall AC units—from $250 to $650— installation is a breeze compared to other types. Mini-split ductless HVAC units are relatively new to the world of cooling and heating—at least in American homes. Invented in the 1980s in Japan and quickly adopted in Europe, they didn’t find a solid foothold in the US until about a decade ago. A mini-split ductless AC unit both cools and heats. To do both cooling and heating, it is an electric appliance that utilizes heat pump technology. Like the other AC units discussed here, it is meant for single rooms or small areas. A compressor/ heat exchanger stands outside. This connects by flexible hoses that run in a 3-inch conduit through the wall to an inside unit that mounts on the wall or ceiling. 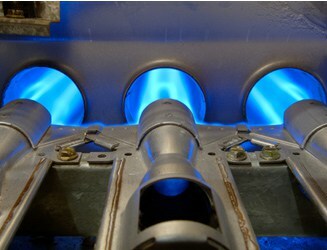 In some cases, the compressor (and the noise it makes) can be located up to 50 feet away from the indoor appliance. Unlike a conventional AC unit that is either off or on, the compressor of a ductless AC unit slows down or speeds up to meet the needs for cooling or heating. This makes it more efficient. Compared to a central AC system, they are about 30% more efficient because they don’t lose conditioned air that leaks through ductwork on its way to rooms. Another downside, compared to central air conditioning, is the very visible blower unit that mounts on the wall or ceiling of a room. The wall-mounted appliance, however, can be an advantage over filling up a window with an air conditioner or rolling a portable AC unit around your room. One other disadvantage of relying on a mini-split system for both air conditioning and heating is that, in a particularly cold climate, some units may not provide enough warmth. Be sure to buy one that will. A ductless mini-split air conditioner can be the perfect answer for adding air conditioning to a new addition, such as a converted attic or garage, bonus rooms, and the like. Anywhere that running new ductwork would be impractical or ridiculously expensive, one of these units can be a good answer. If you have central air conditioning but you don’t want to afford running the entire system, it can also be a good choice for cooling only the rooms that get the most use. Because room air conditioners use a lot of electricity, all new room air conditioners must have an EER, or Energy Efficiency Rating, which measures how well the appliance converts energy to cooling. The higher the EER, the better. Though air conditioners built before 1991 may have an EER of 5, newer AC units must have an EER of 8.0 or greater. Energy Star® qualified units have ratings as high as 11.5. A high EER also helps the environment by reducing greenhouse emissions. Check the yellow Energy Guide® label on new room air conditioners when you’re shopping. An EER of 10 takes half the energy of a 5 EER. One of the best ways to ensure efficiency is to buy the right size window, wall, or room air conditioner. 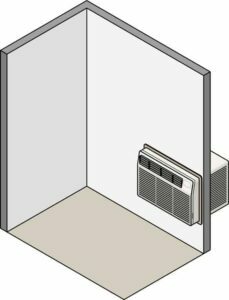 For an explanation of how to size one of these units, along with a sizing chart, see Sizing a Room Air Conditioner, below. Variable Fan Speeds. Many units have variable digital controls instead of the simple HIGH and LOW settings of earlier models. Units with energy-saver switches provide further help in cutting down on utility costs. State-of-the-art AC units offer easy-to-use digital controls. More speed settings give you greater control of air flow, which also helps save money. State-of-the-art AC units offer easy-to-use digital controls with energy-efficiency settings. Shop for air conditioners now. Digital Temperature Control. The ability to control temperature by degrees—instead of with simple HIGH or LOW settings as previous models had—allows for greater comfort as well as increased energy savings. Programmable Thermostat. 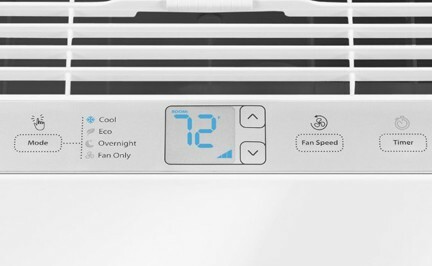 Though it comes as a premium, you may want to pay a little more for an AC unit that lets you program desired settings for different times of the day and night. Easy-to-access Filters. Filters remove dust and other allergens from the air. Filters that slide out make cleaning them a snap. Regular maintenance will extend the service life of your air conditioner and keep it operating at full efficiency. Sleep Setting/Energy-Saving Setting. The unit operates at a very low setting during nighttime hours, making the room more comfortable for sleeping and at the same time saving on energy costs. Timer. Timers are a simpler and less costly alternative to programmable thermostats. Just set the time you want the AC to start or stop. Timers let you come home to a house that already is cool without continuously running the air conditioner while you’re away. Room air conditioners perform best when they are sized properly. If an air conditioner is undersized, it won’t be able to handle the room’s cooling needs. An over-sized air conditioner will cycle on and off, wasting energy, increasing electric bills, straining the unit, and doing a poor job of dehumidifying the air. Before shopping, measure the dimensions of the room you want to cool. 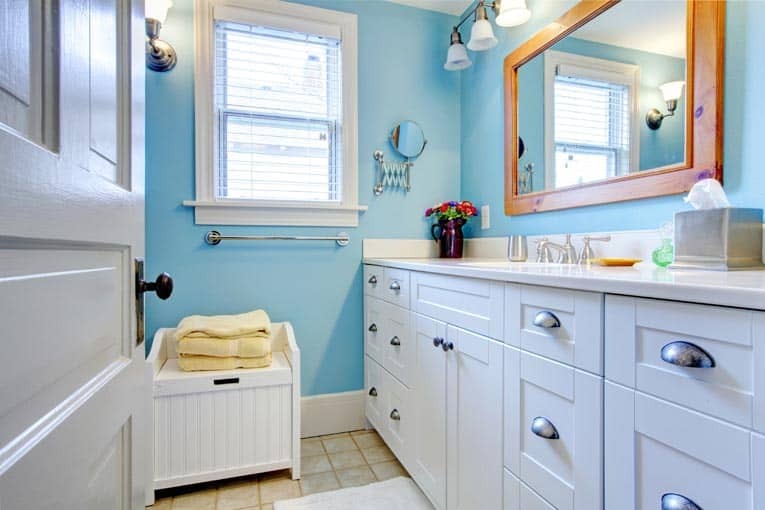 Multiply the room’s length by its width to get the square footage of living space. Then, match the room size with the BTU rating, typically printed on the product box. As a rule-of-thumb, figure 20 BTU for each square foot, though your climate, window sizes, house shading, and the room’s height will affect this calculation. Room air conditioners operate at 5,000 to 24,000 BTU per hour; 12,500-BTU units are considered large. Expect the cost of the air conditioner to increase as the BTU rating goes up. Small room air conditioners generally operate at 5,000 to 7,000 BTU per hour and can adequately cool 100 to 300 square feet. Mid-sized models run at 8,000 to 10,000 BTU per hour. They can cool a room from 250 up to 450 square feet. A large unit rated between 10,000 and 12,500 BTU will cool a room sized 400 to 650 square feet. If you live in a very warm climate, you may need an AC unit that outputs more BTU per hour than recommended. Add 10% capacity for particularly sunny rooms or subtract 10% capacity for shady rooms. If the room you are cooling is permanently open to an adjoining space, figure the square footage of both rooms when calculating the size air conditioner you will need. Portable air conditioners generally are not as efficient as window air conditioners, so it is a good idea to get a more powerful unit than the square footage indicates. Air conditioners remove water from the air as they cool it. 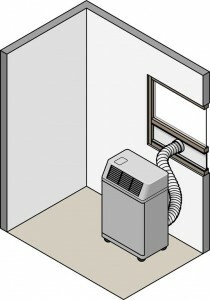 Window and in-the-wall air conditioners have drainage tubes that carry condensation outside. Portable units have reservoirs that need to be periodically emptied, though some also come with optional hookups for a drainage hose. Some new models evaporate much of the moisture and exhaust it, greatly reducing the frequency of need to empty a container. Before buying, be sure your home’s electrical system can handle the appliance’s power needs. If a dedicated or 230-volt circuit is required, you’ll need to have an electrical contractor install this. Keep your room’s layout in mind when purchasing a particular model—make sure it will be able to direct cooled air where you want it. 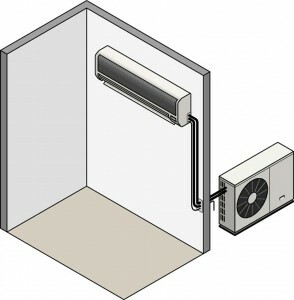 If you’ll be installing the air conditioner at the end of a long room, consider buying a model that has a “Super Thrust” or “Power Thrust” fan control that pushes air further into the room—just be aware that this type of unit will be noisier than standard models. If you have a window, wall, or portable air conditioner but it doesn’t turn on or does a poor job of cooling, try to fix it before you invest in a new unit. For do-it-yourself tips on how to get the unit working, see How to Repair Window and Room Air Conditioners. The following video by Consumer Reports offers excellent advice for buying, sizing, and locating a window air conditioner. Window and room air conditioners are sold at most big-box home improvement stores and other large retailers. Frigidaire, GE, Kenmore and LG are among the top-selling brands. Free-standing portable air conditioners, which can roll from room to room, need only minimal setup. You just plug a window air conditioner or room ac unit into a receptacle, though some require electrical improvements. Relatively small room air conditioners, such as those that draw less than 7.5 amps of electricity, simply plug into a standard 120-volt duplex receptacle that doesn’t share power with other major appliances. Larger AC units require a dedicated 120-volt circuit—in fact, the largest models need a 230-volt dedicated circuit. Take these electrical needs into account when you select a model.